When I saw the theme of this month's Sugar High Friday was citrus, I was up for the challenge. But time skipped by, and things didn't go quite as I had planned. Now, I could tell you that I had planned on turning the orange sponge into orange and lemon petits fours. I could tell you about my daft decision to try and roll this cake (and filling) to make an orange/lemon roll. I could tell you that my teenage son had the 'great idea' to cover his slice of cake in vanilla sugar and then set fire to it while trying to caramelize it with my blowtorch. Instead, I'm just going to say that I ended up with an orange cake, brushed with a Cointreau syrup, which was then filled with Dorie Greenspan's extraordinary lemon cream, whipped double cream and topped off with an orange/blueberry sauce. All of which tasted really good, even if I did torture myself over it. I'm sending this over to Helen of Tartlette, who is the host of this month's Sugar High Friday. Grate or zest the rind of the orange and put into a small saucepan, along with the juice of the orange and the brown sugar. Bring to a boil and add the blueberries. Turn the heat to low and cook for a few minutes until the berries are beginning to soften. Add the cornflour/water mixture, also the Cointreau, and stir until the mixture begins to thicken. Pour into a small dish and leave to cool. That orange cake with blueberry sauce looks really good! Beautiful cake, once the smoke alarm stopped!!! LOL That looks very nice, Nic! personally, i'm selfishly glad your other plans were foiled. your final product looks delicious, and i love, love, love oranges and blueberries together. masterful! LyB - thanks and yes, that is a great combo! Sue - ha ha, well this bit didn't get the torch on it! Grace - I'm glad too! Thank you! giz - I wish I had taken a photo of the flaming cake! Great looking cake! I love the idea of the blueberry sauce! That is the kind of dessert I'd like to go home to, Nic. And thank you for the comment you left and for the hugs - you are a truly special person! That cake looks so fluffy and yummee that I am tempted to bake it tomorrow! whatever troubles you may have had, you wound up with something great-looking in the end! Lemon and orange and cointreau...beautiful! 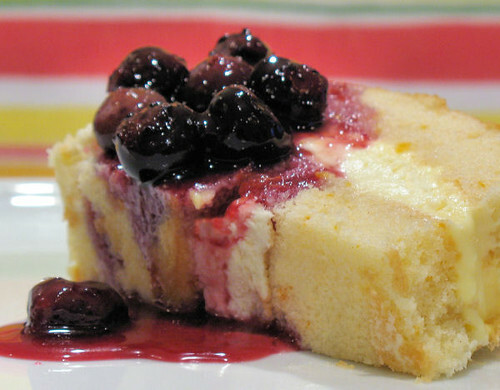 Well, however you got to it, this is a beautiful looking cake, and the lemon cream and blueberry sauce sound gorgeous! It certainly looks the part. The thought of all that lovely citrus tangy-ness is making my mouth water! Somtimes the best laid plans gone wrong lead to even better creations! I love the cake...rich but light looking...my kind of torture! It doesn't really matter what you did or didn't do with the cake - it looks amazing. Knock knock...lemme in! This is sublime Nic. Love the idea of fresh fruit in dessert...always ROCKS!! Looks so yummy and moist...just calling out to be eaten! i love the sound of that sauce!! great addition on cointreau. love it. and the cake. oh man. bad cravings. Ah, such lovely, fresh flavors, Nicisme. I just saw fresh blueberries at the farmer's market last week too! Wow - that sounds and looks astonishingly good! Like the idea of using blueberries with it too. I would definitely enjoy this little delight.